Here are some pictures of plants that you may at first glance think are proteas. Well as you have already guessed, they are not. The Strawberry Everlasting is a member of the Daisy Family. 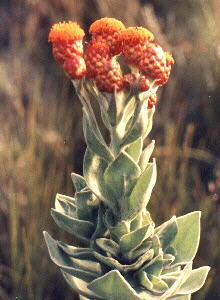 It grows mainly in the Langeberg Mountains and is probably pollinated by butterflies and beetles. Seeds are stored for a while and then released. The Cushion Daisy is a member of the Daisy Family. A relative of the Rabbits Ears, the Cushion Daisy is a high altitude species growing in very rocky areas where it is safe from fire. The plants form tight cushions, which protects them from UV radiation, snow, sleet and frost. This species has been mistaken for a protea, especially when it flowers. It can be distinguished from other species in the genus by the flowerheads that have no stalk and are thus borne within the cushion. It occurs from Caledon to Uniondale, but is seldom seen except by those scaling the high peaks. The Rabbits Ears is a member of the Daisy Family. 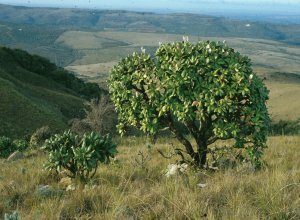 It grows mainly in the Grahamstown area in fynbos, where it appears to replace the larger proteas - in fact its ditribution range continues where the Waboom - Protea nitida and Strapleaf Sugarbush - Protea lorifolia drop off. 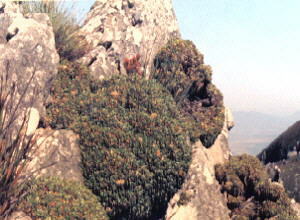 In its growth habit and size (which distinguish it from other members of the genus) it may be confused with these protea species at a distance. However, it has leaves which are glossy green above and woolly-white below - quite unlike that of any protea. 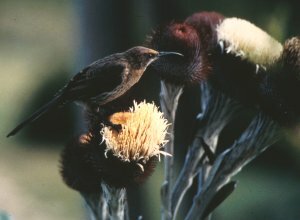 It is very unusual in the Daisy Family in that it is pollinated by Sugarbirds and Sunbirds - another example of its "trying to be a protea". There are three other species in the genus.